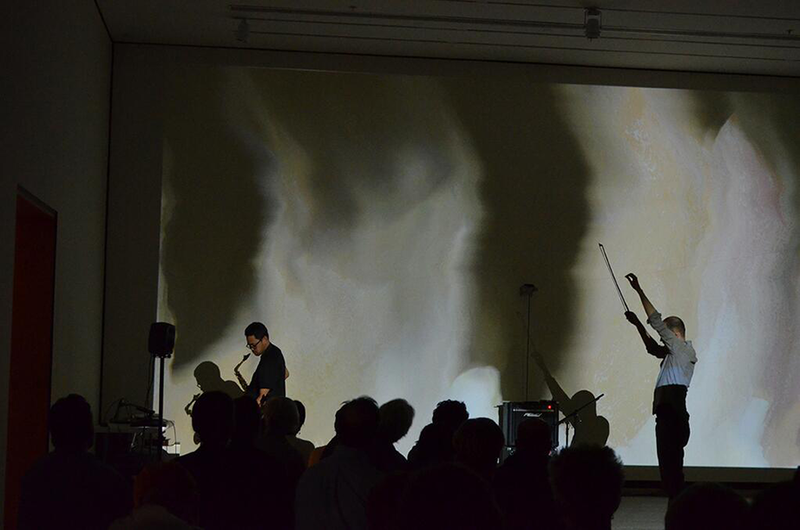 A performance for a custom-built 40-foot electric guitar and projection, in collaboration with composer and musician Damon Lee, performing with processed alto saxophone. Performed at the Sheldon Museum of Art in Lincoln, Nebraska, USA. The long-string guitar is made up of two pieces, a bridge/pickup end and a nut/tuner end, and built from aluminum extrusions to be completely adjustable and customizable. Using a single string, the guitar is capable of a surprising range of sounds from deep rhythmic thrumming, pitched drones with considerable harmonics, and squealing high-pitched yelps. It is actuated by a variety of methods and tools, including plucking and rubbing with the fingers, bowing, and using custom-built aluminum tools for scraping and otherwise modifying the pitch.